"[Porter] can flat out score, shoot the ball, spaces the floor. He's doing a little bit of everything." Zach LaVine on Otto Porter Jr.
Zach LaVine ranks with the likes of Stephen Curry, James Harden and Damian Lillard among the top 10 scoring point/shooting guards in the NBA, averaging 23.1 per game with a 41-point scoring game this season. Lauri Markkanen with his fifth consecutive game with at least 20 points and 10 rebounds joined only Michael Jordan and Scottie Pippen with such streaks in franchise history. 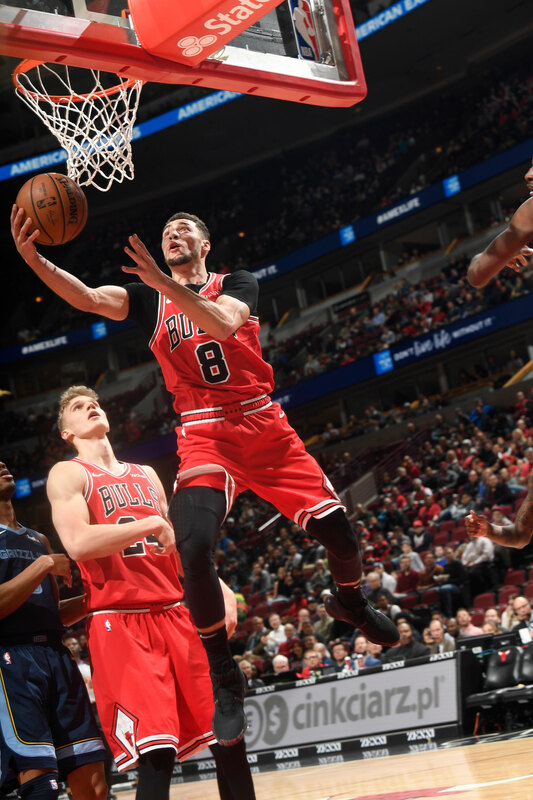 And Wednesday with 37 points in the Bulls 122-110 victory over the Memphis Grizzlies, Otto Porter Jr. set a career high while adding 10 rebounds and three of five three pointers while averaging 22.5 points since he was acquired by the Bulls. Could the Bulls actually have something going here? "Dude gets it going like that you have to go to him," said LaVine. "We played a solid overall game and got off the schneid at home (after 11 straight losses). (Porter) plays so many different positions. He's a veteran, he knows what he's doing. Very smart, talks on defense, can flat out score, shoot the ball, spaces the floor. He's doing a little bit of everything. Since he's been here, I feel like I've been able to get more driving lanes, easier catch and shoots or with him playing two-man games and Lauri getting more open shots. "Recently with Lauri the way he is rebounding the ball and him pushing it, before I was sitting in the backcourt waiting," said LaVine. "Now I am running the floor and getting outlets. O can get it off the glass and obviously I can get it off the glass, get in the paint and facilitate. It gets us a little faster pace. I'll take it all day; better than slowing it down." It was the fourth time in the last five games the Bulls have scored at least 120 points, polar opposite of the game they were playing even a month ago. LaVine playing considerable point guard with Kris Dunn out injured after a hard fall Monday. LaVine had 15 points, seven assists and six rebounds. Robin Lopez had 25 points, 12 in the first quarter on the receiving end of several slick passes from LaVine and Ryan Arcidiacono, the latter who started for Dunn. Arcidiacono had a career high 11 assists. The appeal and perhaps hope of the way the Bulls have been playing since the arrival of Porter has been with LaVine, Porter and Markkanen, primarily, rebounding and running out with the ball. It's similar to the effective tactic the Golden State Warriors employ to limit opponents from setting up their defense and providing varied and quick hitting scoring options. (Otto) is a basketball player; that's what we needed, that's what we got. With the rugged 6-8 Porter capable of playing small forward and power forward and Markkanen playing some at center in the quicker lineup, the Bulls at times looked like a stampeding herd instead of senior citizens navigating an icy sidewalk. The Bulls had 17 fast break points and shot 56.2 percent. They're not quite in that modern NBA yet with just eight made three pointers. LaVine attempted just three and clearly needs to shoot more from deep, though he was running the ball out of the backcourt more. He did play some point guard as a rookie and at UCLA, so he has that sense of the floor with a scoring mentality and threat that's vitally needed at that position. The Bulls had 28 assists and a powerful 47-31 rebounding edge even with the return of Joakim Noah, who got a standing ovation when he entered the game. He had eight points in 20 minutes. But it was the appealing offensive style with multiple credible scoring threats with Porter that gave the Bulls the game momentum and the modern look worth another. Porter was considered with the Wizards a reluctant shooter, but he played without hesitation and shot a remarkable 16 for 20 without seeming to force any. "(Otto) is a basketball player; that's what we needed, that's what we got," said Bulls coach Jim Boylen. "What that means is you can throw him out there, he can gets somebody else going, he can get himself going, he can make shots off the move. He showed the whole thing, three off the dribble, two off the bounce, back in, post move , crossover layup. Showed a lot of versatility. He can play in our multiple ball handler system in transition and make decisions. I am really thankful he is a Bull." Bobby Portis, who was traded along with Jabari Parker for Porter, has been somewhat defensive about positive Bulls comments regarding Porter. But they are not meant to denigrate Portis as much as Porter as a scoring small forward with ball handling and three point shooting abilities—he made several full court forays and finishes with rebounds Wednesday—answers a greater Bulls need. Offensively, the ball was moving side to side, everyone touching it; it felt good. We were playing team basketball. We all loved and miss Bobby, though the Bulls have to be smiling about Otto. "We've got guys to make plays across the floor and we have shooters," said Porter, whose fit has been remarkable so quickly after a mid season trade. "I played with two All-Stars (John Wall and Bradley Beal), so it's totally different. My teammates and my coaches, they helped make that transition so much easier. Guys who get traded during the season, it is kind of tough for them to get going right away. But here it was nothing like that. They welcomed me with open arms, this whole organization. So I am just blessed to be here." "I feel like it was a must win for us," Porter admitted of the home losing and the Bulls 14-44. "Playing in front of our home crowd it was a must win going into the break. I've been on playoff teams; just showing my knowledge with the team and trying to learn. I see things and I am just sharing it with everyone. I was just able to get going offensively; it helped us. Defensively we could fly around. Offensively, the ball was moving side to side, everyone touching it; it felt good. We were playing team basketball." Though Boylen said afterwards the defense needs to improve, I thought the defense was mostly good. The Bulls closed much better on three-point shooters and were effectively chasing a team that moves the ball well. Though Porter was almost perfect offensively, the game's best play might have been Porter late in the second quarter with the Bulls trailing 56-53 sprinting almost fully across court seemingly about as fast as the ball to block a right corner three by Jaren Jackson Jr.
"(Porter's defense is) huge," Boylen agreed. "It's what we have to have and it's why we liked him. He can guard basically one through five. He communicates early and often, loud and clear. He sees things coming. He talks in the huddle. [You] hear him talking, ‘First five minutes to start the half.' Those are important moments for a young team learning how to win and trying to play good basketball for 48 minutes." It perhaps was no coincidence that the Bulls basically controlled the game after that play. The Bulls led 36-32 in a frenzied first quarter with Porter's hot shooting to start 12-4 and Lopez scoring off LaVine and Arcidiacono passes. Memphis with six players in double figures led by Avery Bradley with 15 moved ahead in the second quarter. But after Porter's rejected the rookie seven footer, the Bulls closed the second quarter with a 14-4 run. And then Porter took care of those slow second half starts with a floater, a jumper and a dunk to get the Bulls off on a 13-4 start to the third quarter, 27-8 Bulls overall in that 10-minute span. "Otto, he's a pretty good basketball player," Markkanen said with a smile, turning left to his locker neighbor. "He's pretty easy to play with. We have multiple guys doing different stuff; that's hard to guard. It's a good look for us, just mix the defense up. They're not really used to four guys bringing it up—and if I'm the five, we've got five guys bringing it up–-so they're not getting matched up. We've got to get the defensive board and not take it out of the net every time and get out and run. We've got guys to make shots, so it's a fun game to play." The Bulls led 92-83 after three quarters and the Grizzlies, 23-36, didn't get closer than eight as this time there was no run to unhinge the Bulls. Porter did open the fourth with a score, which seemed to settle a jumpy reserve group who then combined for a 105-90 Bulls lead with nine minutes left, bookended by another Porter pullup. So this time the Bulls could survive the typical for them and subsequent three scoreless minutes without panic and a victory. Wayne Selden scored a pair of baskets in that fourth quarter run, but the bench that Boylen Monday said needed to improve without Portis and Parker was outscored 64-22. Time for a significant change? The reserves lost their captain, their big toe, in Portis. One impressive victory for the Bulls after 18 losses in the last 21 games doesn't indicate that much. But the way the Bulls can evolve with Porter, LaVine and Markkanan capable of playmaking raises the question of whether Dunn would be ideal as a leader for that reserve unit. The 6-4 point guard is a defender who could rally a group of tough players like Selden and Shaquille Harrison and also be in position to be more of a scorer, which would be difficult playing with the starters now that Porter is included. It would be a bold change, though really not a demotion. Dunn is better than Arcidiacono. But Arcidiacono with a three-point shooting component and a player who controls the ball less perhaps is a better fit with those ball handling starters. It will be among many things to think about with the Bulls now off until Feb. 22. No one expects Porter to shoot often—or maybe even ever again—like he did Wednesday. But his rare veteran presence on a young team and threat as one of the league's most accurate three-point shooters and a ball handler gives the Bulls a starting unit with three potentially elite offensive players. It's generally the foundation of what can change the fortunes of a franchise. "We can build off what we did tonight," said Porter. "Continue to play for each other, continue to be open to learning and growing." But what about him, Porter was asked. "Just a winner," he said.